First and foremost, you need to understand that your marine engine is a complex machine with complex systems and complex components. This means that operating it effectively and safely requires certain know-how. To ensure you have it, you need to read your owner's manual thoroughly, from beginning to end. In it, you'll find instructions on how to operate the exact model you own. Moreover, you'll learn tips on how to maintain it properly, what special requirements it has, how to react to certain situations, and more. Even if you've owned your boat for awhile, it's a good idea to go over the manual once more to refresh your memory, especially if it's been in storage during the winter months. One of the most important things to look into is the boat's fuel system. Needless to say, this system is crucial, as you won't be able to go very far on your boat without it. For that reason, you should inspect it and verify that it's not leaking or damaged at all. Another component you should pay attention to is the water pump. This is an essential element in the boat's cooling system. Nonetheless, time and use can render it useless. Check it before going out. If it's old and worn down, you should replace it promptly. Just like your car, your boat needs a battery and a functional electric system in order to power some of its key components (like the lights or the radio). To ensure it works, keep it clean and in good shape, so it won't fail on you and leave you stranded in the middle of the water. Speaking of being stranded, you need to make sure that you're completely prepared to deal with emergency situations that may arise. To that end, it's imperative that you take care of your boat's safety equipment. For example, the life jackets, the flashlights, the first aid kit, the fire extinguishers, and other useful tools should be in your boat and in good shape, so you can employ them effectively and remain safe in a less-than-ideal situation. Last but definitely not least, it's extremely important that you check your boat's fluids. As you may be aware, it requires certain fluids to perform as expected (e.g. the motor needs synthetic oil). 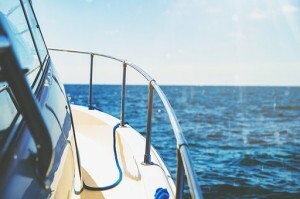 The idle period could have taken a toll on them, so check on them to make sure your boat won't fail you while out on the water. Feed Your Boat's engine with AMSOIL 10W-30 Synthetic Marine Engine Oil, the most effective synthetic oil in Show Low. Something you may not think has an effect on your vehicle's performance, but that could actually influence how it works and its lifespan, is your boat's cleanliness. This is because trash, debris, dust particles, and other gunk, small as they can be, can filter into your boat's inner-components and wreak havoc on them. If you do a good job at washing your boat with regularity, you'll notice that it performs strong and powerful for a lot longer. Take care of this to prevent having to replace/repair its components later on. Finally, you need to make sure that a professional mechanic inspects your boat with some regularity. Professional inspections are the best way to guarantee that all is well with your boat. Not only that, but if there is any issue, a professional mechanic will be able to provide the necessary fix, so that your boat can work as expected for a long time. Browse AMSOIL's online shop or call John O Brown at (520) 444-2634 to place an order on the best synthetic oil in Show Low for your boat's maintenance.